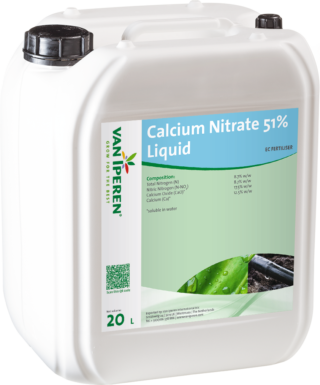 Van Iperen Calcium Nitrate 51% Liquid is a pure and highly concentrated liquid Calcium fertilizer, free of Ammonium. Our product is a transparent, stable solution and is recommended as of early spring until fruit setting. The high level of Calcium in our formula improves the strength of cell walls. The presence of Nitrogen has a positive effect on the uptake of Calcium in the plant. Which Calcium Nitrate to use? Calcium Nitrate is a good source of both Calcium and Nitrate. Depending on the type of application, you can choose between different grades and formulations. 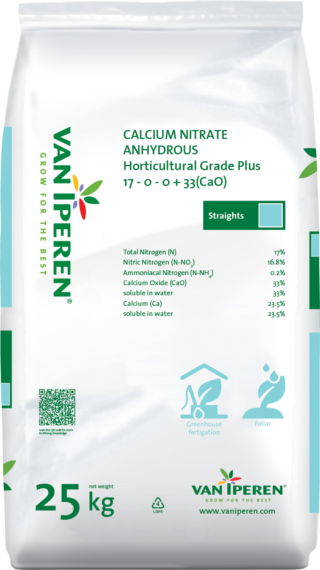 Van Iperen offers you the widest range of Calcium Nitrates. Let’s see which one suits your needs.